It's time to write about my cartoon names again. Every once in a while, I feel like I need a generic last name on a sign or in a caption, like "Whitmore" above. My favorite name of choice was, and still is, "Nagle". Richard Nagle is my son-in-law, and I've used his name so often that he rates a separate "Topics" category listing. I've also used the name "Farber" a few times, and as I've explained before, that was my little tribute to radio talk show host Barry Farber. I used to listen to him a lot as I cartooned late into the night. Barry Farber is still around, by the way -- I heard him a few days ago, phoning into a talk show. 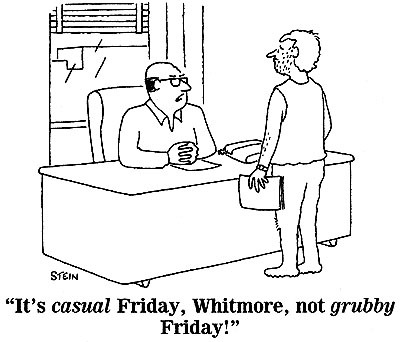 As for the name "Whitmore", that goes back to my Army days in the early 1950's. Lieutenant Whitmore was one of the few "good" officers I came in contact with (as opposed to all those other officers who lorded it all over us lowly enlisted men). For instance, you could actually have a conversation with Lt. Whitmore and not have to worry about the consequences afterwards. I distinctly remember telling my cartooning Army buddy, Tom Wesselmann, that I had found my "cartoon name", and that it was going to be "Whitmore". Tom smiled knowingly and acknowledged that it was a good choice. I've written about my Army days before in these archives, and you'll find all the postings under "Eli's Corner". The last one is right here. So here's to you, Lieutenant Whitmore -- I'm sorry I don't remember your first name, but "Lieutenant" has always been good enough for me.